Today at sundown, December 12th begins Chanukah. It is also spelled Hanukkah, meaning “dedication.” This Jewish holiday traces its roots back more than 2,000 years. At that time the Jewish people were living under the oppressive government of the Syrian ruler Antiochus Epiphanes IV, (a rather ironic name — Epiphanes means “God made manifest”) who was a descendant of Seleucus, the general of Alexander the Great. During Antiochus’ rule, he forbade the reading of the Scriptures, circumcision, Sabbath observance, and a number of other religious practices. To further promote the “Hellenization” of Palestine, conforming it to Greek culture, he set up in the Temple of Jerusalem an altar dedicated to the Roman god Jupiter where swine were offered in sacrifice. This “Abomination of Desolation” caused the Jews to rebel in what became known as the Maccabean Revolt, and under the leadership of Judas Maccabeus “the Hammer” the Syrians were overthrown, and the Temple had all signs of paganism removed. The statue to Jupiter was ground to dust. A feast was instituted on 25 Kislew, 165 B.C. for the purification of the Temple. The story goes that light of the Temple was relit with only enough pure oil to last one day, but miraculously lasted for eight days, until more could be found. The Festival of Lights is celebrated for eight days. One of the most important Chanukah customs is to light colorful candles in a menorah or candelabrum with eight branches, one for each night of Chanukah plus one prominent one that holds the candle to be used to light the others, for a total of 9 stems. On the first night, one candle is lit and each succeeding night another is added so that all eight are alight on the last night. 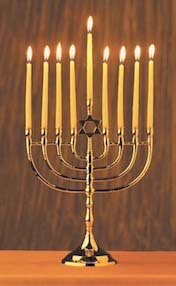 Some menorahs have seven branches as described in Exodus 25:31-40 (and as pictured above.) 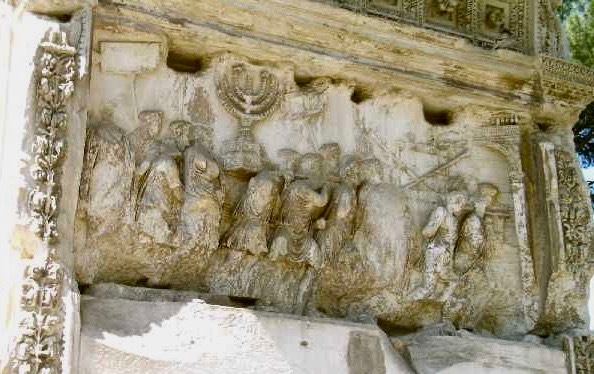 I took this picture at the 1st-century Arch of Titus at the eastern entrance to the Roman Forum, depicting Jewish slaves being brought to the Imperial City as part of the triumph parade following the Fall of Jerusalem to Rome in 70 A.D.
Because the Chanukah story involved oil, foods fried in oil are traditional for the holiday. Potato pancakes appear to have come to us from Russia. There Jews made “latkes” or pancakes from a great variety of ingredients, from cheese to buckwheat flour to noodles. Legend says that women behind the lines, during the Jews’ fight against the Syrians 2,000 years ago, made flat cakes for the warriors because they could be prepared quickly.